Invitation To 148th UNN Inaugural Lecture by Professor Chuku Umezurike. 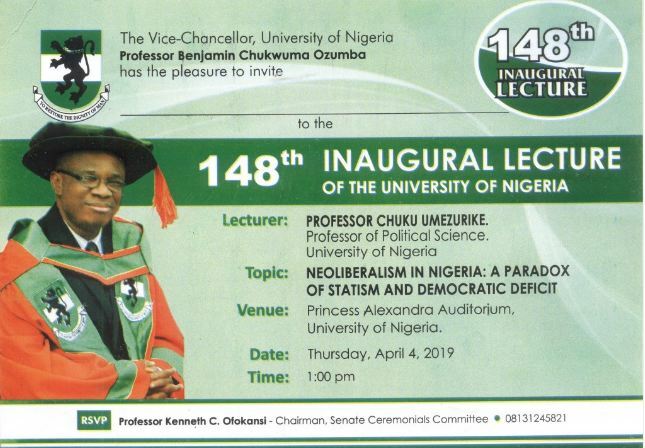 The Vice-Chancellor of the University of Nigeria, Nsukka (UNN) Professor Chukwuma Ozumba has the pleasure to invite the entire members of the University Community, as well as the general public to the UNN 148th Inaugural Lecture. The Inaugural Lecture, titled, “Neoliberalism in Nigeria: A Paradox of Statism and Democratic Deficit” will be delivered by Professor Chuku Umezurike (A Professor of Political Science).